Phantoms will not dwell on a first blank weekend in almost four months. 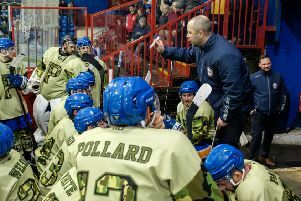 Player-coach Slava Koulikov insists his depleted team have already ‘moved on’ from a 5-3 derby defeat at arch-rivals Milton Keynes last Saturday night and a 5-2 home reverse at the hands of reigning play-off champions Basingstoke 24 hours later. It was the first time since October 18/19 that Phantoms had lost games on successive nights. Koulikov admitted: “We twice battled back to get ourselves level in Milton Keynes last Saturday and it was pretty even for the first half of the game against Basingstoke. “But it was evident that playing short-staffed for the last six weeks has caught up with us. “I’m not making excuses – that’s just the way it is. Physically we couldn’t match our opponents as the games went on and we are making mental errors which come from tiredness. “We recently went on a run of six games where we only dropped one point, so I’m certainly not going to dwell on one weekend with no points. “It doesn’t make or break our season, but it is a learning experience just as any losses are. “It was very clear in the locker room last Saturday and Sunday that the guys do not like losing. Phantoms have only one outing as they entertain Swindon on Sunday (5.30pm). The Wildcats could have leapfrogged the city team into fourth spot by the time the puck drops at Planet Ice. They were scheduled to be in action at home to Milton Keynes last night (Wednesday) and also go to Guildford on Saturday. Koulikov hopes to have forward Luke Ferrara available after he missed both games last weekend. The local lad had taken a blow to the head against Sheffield on February 8. Defenceman James Hutchinson, import forward Darius Pliskuaskas and youngsters Mason Webster and Martins Susters have all started skating as their respective injuries heal, but they are not yet close to being available for selection.